Turn tire kickers into customers (and other lead nurturing cliché’s that actually work). Lead nurturing can seem overwhelming – especially with everyone yelling for it, but few understanding what it’s all about. The key to success is starting small and building a foundation. Read this helpful guide to discover common mistakes and dependable answers for lead nurturing (hint: it’s more than just a follow-up email). Brought to you by the Modern Marketing experts, Oracle Eloqua. 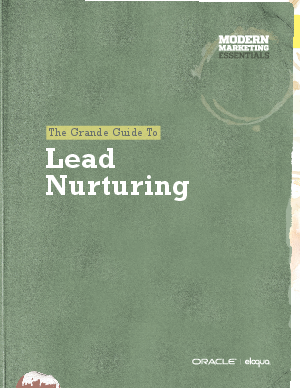 Read the “Grande Guide to Lead Nurturing” now.